Biggest Success: FINISHING CHAPTER THREE! It was late wednesday night when I felt the change come to my weekend’s doorstep. April, my lovely friend whose English wedding I attended a month ago, came for a visit. So naturally, it was an English-Infused weekend by association. I am friends with her, she is married to and English man–done! It was a wonderful weekend. Friday we watched Sense and Sensibility while drinking tea. Luckily too, she came bearing gifts (lucky for me, I mean). I unwrapped a book she purchased for me while she was at the Tower of London, and it is a cookbook for traditional English sandwiches, scones, and deserts that you can make for afternoon tea. And of course, a book mark with a picture of the Lakes where we were for her wedding. Both were incredibly special, and she noted inside the book certain quotes and her own sentiments on giving me inspiration for my writing. Which something more British always does! The English essence did not end there! 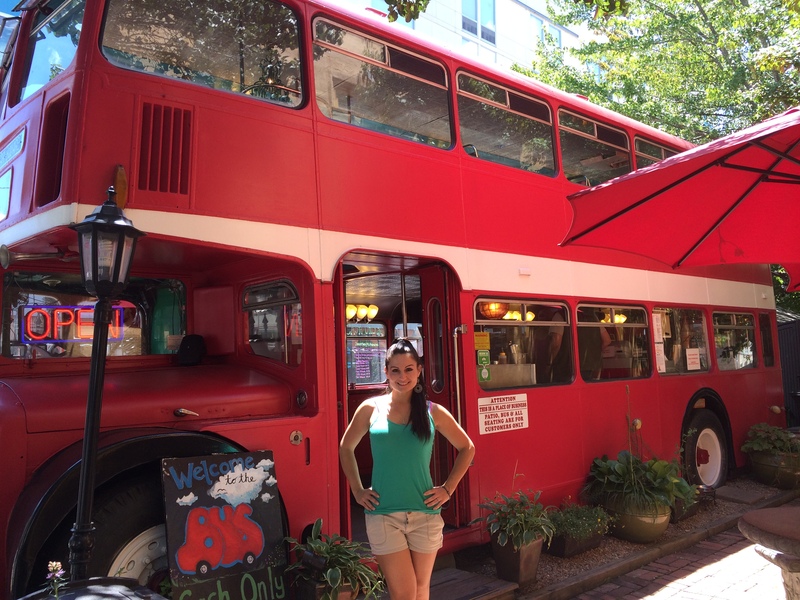 We went to Asheville on Saturday where I took her to a coffee shop inside a double decker bus! How on earth we have that in North Carolina is beyond me, however I am happy nonetheless. I have not spent a lot of time with my novel this past week. I knew the end of Chapter Three was near, but I had no idea how to end it. Every chapter is a story in itself. I find that I want to end each one with a sort of mystery. On that note, it is a mystery to me on how to do that adequately. There are many things that I still want to include, but as the chapter tips over the ten page line I begin to draw a line. One cannot tolerate a very long chapter. It ended with me writing a scene, pausing, and saying “yes, lets just end it there”! That then allows other ideas to spill into the next chapter, which I find comfort in knowing now what I will write about when I start chapter four this week. Cheers! Posted on August 3, 2015 September 23, 2015 by KLMcCarty	This entry was posted in Uncategorized and tagged Asheville, Jane Austen, tea. Bookmark the permalink. ← Queen City for “Queen and Country”! I am still trying to catch it. I got a trap from Friends of Feral Felines. It isn’t buying it though 😦 Ill keep you updated!